Dr. Diesburg and Students Attend "Grace Hopper Celebration"
Last month, Dr. Diesburg and a contingent of UNI CS students attended the annual Grace Hopper Celebration (GHC). GHC is the world's largest gathering of women technologists. UNI CS sends a group of students and faculty to the conference each fall. Last month, the Women in Computing (WiC) group helds its first Take Apart a Computer workshop. Aproximately 15-20 students worked in teams of two or three to take apart one of ten computers salvaged for the workshop. Everyone had fun while learning about the inside of a computer by taking it apart and reassembling it. After the workshop, Prof. Diesburg reported, "More than one student went out of their way to tell me that they had never taken apart a computer before, and how useful this was to them. This was especially true of the female students. One of them told me that now she is going to take apart a computer she has at home to fix it. Before the workshop, she was intimidated." WiC will be hosting a larger-scale event of this type during the Spring 2017 semester open to all students. Prof. Sarah Diesburg was honored with the Academic Innovation and Leadership Award at the 2016 Iowa Women of Innovation Awards this week. Congratulations, Dr. Diesburg! Jessica Thatcher, a double major in Computer Science and Physics, is featured in the latest "STEM Story" on the UNI STEM Ed website and Facebook page. Jessica is a senior with an emphasis in Software Engineering. Computer Science students Beau Brown and Coved Oswald were busy this summer with an undergraduate research project that explores ways to use software and mobile devices to interact with virtual objects. Read more about their work in CS Students Present at Summer Undergraduate Research Program. On Saturday, the Spring 2016 class of the Department of Computer Science graduated. Congratulations to all! One of our spring graduates, Lisa Diercks, was featured in the "Student Spotlight" of the college's Update newsletter. You can read her profile for more information. A team consisting of UNI CS students Marc Reyes, Brian Paterni, Douglas Murray, and Sheriff Jorkeh finished in second place last weekend at the Argonne National Labs' first national cyberdefense competition. The department's Women in Computing Group is putting on Coding Against Cancer this Saturday to have fun and to raise money for the Beyond Pink TEAM in the Cedar Valley. There will be activities with Lego Mindstorm robots, brain teasers, a bake sale, and games, as well as a hackathon for people who would like to write a little code while helping a good cause. Join the fun Saturday, October 24, from 12:30-6:30 PM on the lower level of Maucker Union. Prof. Aleksandar Poleksic was given the Outstanding Paper award at the 2015 IEEE International Electro/Information Technology Conference in Naperville, Illinois, last week. His paper was titled "Towards a Better Measure of Protein 3d Model Quality". Profs. Diesburg and Schafer have received an NCWIT EngageCSEdu Engagement Excellence Award for their work designing engaging laboratory exercises for CS 1510 Introduction to Computing. Read more at the NCWIT award page. Dr. Sarah Diesburg has launched the Lab of Storage and Security Technology, to study computer privacy issues dealing with data and storage, in particular specialized forensics and anti-forensics techniques for recovering, destroying, and hiding data. This summer, CS student Mojtaba Al Fardan presented "Analysis Of Deletion Habits On Used USB Thumb Drives" as part of UNI's Summer Undergraduate Research Program. The May 8 issue of the Waterloo/Cedar Falls Courier included a front-page article on the Heartbleed bug and precautions taken at UNI to avoid damage. In the article, UNI CS professor Paul Gray explains the idea behind Heartbleed and notes that we probably won't know the full potential of the vulnerability for a while. Read more at the Courier in UNI patched servers to block computer bug. Ramya Varadaraju, senior CS major, has been awarded the 2014 Lux Service Award. The Lux award is the most prestigious award given by the university to undergraduate students each academic year. It acknowledges exemplary service to the campus community and "is conferred in the spirit of keeping the light of service to others burning brightly at the University of Northern Iowa". See photos on UNI International Admissions office's Facebook page. Congratulations, Ramya! This month's CHAS Update magazine incudes an article on the UNI CS cyberdefense team and its participation in last month's cyberdefense competition at Iowa State. The team was assisted by Professors Paul Gray and Sarah Diesburg. See Page 7 of the Update, the college alumni magazine, for the story and some pictures. Prof. Ben Schafer and thirty-six students from his Programming Environments for Elementary Education class went to both junior high schools in Cedar Falls last week to introduce eighth-graders to programming as part of CS Education Week. Read more about their work in CS Prof and Students Participate in the Hour of Code. CS student Levi Bostian is featured in the Student Spotlight of this month's issue of the CHAS Update, the college alumni magazine. Levi is a junior from Oelwein. CS student Monzurul Karim Russel is featured in Students You Should Know, a feature on the UNI web site. Russel is an international student from Bangladesh. Three teams of UNI CS students compete this weekend in the programming contest at MICS 2013. The team of Aaron Friel, Derek Hofland, and Morgen Kellis finished in fourth place, out of approximately fifty teams. Check out the video What most schools don't teach. Its release heralds the launching of code.org, which aims to give every student a chance to learn how to program a computer. Famous tech entrepreneurs tell their stories, as do an NBA champion and a pop music star. Cody Bardell will present the results of his undergraduate research at the 27th National Conference on Undergraduate Research, in La Crosse, Wisconsin, this April. Bardell's presentation, Shared Display Interaction Using Mobile Devices, was selected from more than 3,500 submissions as demonstrating "a unique contribution to your field of study". He has been working on this project since last summer with advisors Prof. Stephen Hughes and Prof. Ben Schafer. CS alumnus Andrew Drenner '01 is featured in the Student Spotlight of this month's issue of the CHAS Update, the college alumni magazine. Drenner is co-founder of ReconRobotics, which manufatures micro-robot systems for military and law enforcement. Prof. Ben Schafer will be representing UNI Computer Science well at the 2012 Iowa Undergraduate Computer Science Consortium meeting this weekend at Grinnell College. He is part of two panels in the morning, on programming for non-majors and on media computation, and will give an afternoon talk on the department's CS4HS workshops. CS Alumnus Interviewed on "CBS Sunday Morning"
Computer Science alumnus Sergey Golitsynskiy '07 was interviewed for a September 30 story on "CBS Sunday Morning" called Are we becoming disconnected by our love of devices?. Golitsynskiy, now a Ph.D. student in journalism at the University of Maryland, is cited for his research on the topic. He speaks in the video briefly at 2:30-3:15. Other people interviewed include best-selling authors Sherry Turkle and Nicholas Carr. Computer Science students Cody Bardel and Zach Foltz were busy this summer with undergraduate research projects that explore uses of software to solve real problems. Read more about their work in 2012 Summer Undergraduate Research Program. John Damgaard has been named president of MDI Achieve, a leading provider of software to the eldercare industry based in the Twin Cities. John graduated with a Computer Science degree from UNI in 1991. CS student Jack Kosmicki, a senior graduating with a double major in bioinformatics and biology, is featured in a story on the UNI home page, From UNI to Harvard and MIT, about his summer internships in the Harvard-MIT Bioinformatics and Integrative Genomics (BIG) Summer Institute. Kosmicki will continue his studies this fall in a Ph.D. program at Harvard. CS student Aaron Mangel is featured in the Student Spotlight of this month's issue of the CHAS Update, the college alumni magazine. Last night, T8 Webware was named Iowa Software Company of the Year at the 2012 Prometheus Awards. T8 was founded by UNI CS alumnus Wade Arnold and employs a number of other UNI CS alumni and current CS students. Arnold is a member of the department advisory board. Ten UNI Computer Science students competed in the National Cyber Defense Competition at Iowa State University this weekend. Congratulations to the team of Austin Duve, Ryan Murphy, Keaton Carter, and Nicholas Olson on placing third overall. UNI CS professor Ben Schafer has been selected to serve on the LEGO Education Advisory Panel (LEAP) for the coming year. The educators on LEAP represent both K-12 institutions and universities. They collaborate with LEGO Education "to develop classroom solutions and curriculum that elevate science, technology, engineering and math (STEM) concepts and 21st century learning skills". LEGO selected Dr. Schafer and approximately ten other new board members from 1100 applicants. Wade Arnold Named One of Courier's 2011 "20 Under 40"
UNI CS alumnus Wade Arnold has been named one of 2011's "20 Under 40" by the Waterloo/Cedar Falls Courier. This award "honors outstanding young people in the Cedar Valley who are making a difference in their work and personal lives to make the area a better place". Wade is the founder and CEO of T8 Webware, a rich media and application firm located in Cedar Falls, Iowa. He is responsible for strategic planning, product development, and "creating an exciting and rewarding corporate environment". Read more at the Courier. Nick Cash, a UNI CS student double-majoring in economics has won an Okoboji Entrepreneurship Institute Pappajohn Award for his entrepreneurial activities, academic achievements, and extracurricular activities. Nick is the founder of Book Hatchery, a service that helps authors publish their works digitally. Read more about this year's award in this article by the Golden Shovel Agency. RadioIowa has an article featuring the work led by UNI CS professors Stephen Hughes and Ben Schafer on a smartphone classroom response system. Hughes and Schafer are working with UNI CS students Aaron Mangel and Sean Fredricksen, as featured here in August. 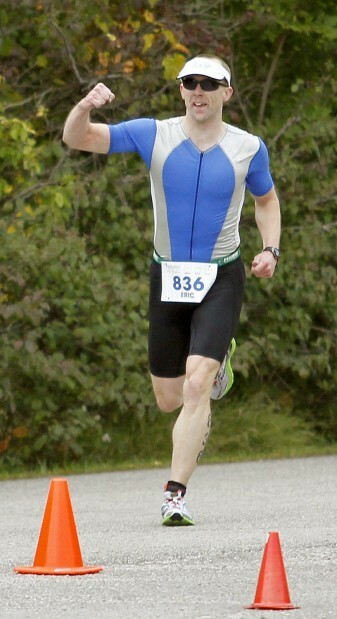 UNI Computer Science student Eric Henely won the 2011 Peregrine Triathlon this weekend in Cedar Falls. Henely, a programmer analyst with UNI's ITS-Information Systems, is nearing completion of his M.S. degree in Computer Science. He has been competing in triathlons for 10 years. With impressive splits in the 500-meter swim, 25-kilometer bike ride, and 5-kilometer run, Henely set a new course record of 1 hour, 9 minutes, 7.8 seconds -- breaking the old record by nine minutes. For a feature story and several photographs, see the coverage by the Waterloo Courier. Prof. John McCormick has received the 2010-2011 Dean's Award for Excellence in Teaching in Departmental Programs from the College of Natural Sciences. This award is selected by the Dean of the college in consultation with the Dean's Student Advisory Council, which seeks nominees from students in all departments of the college. Prof. McCormick was recognized for his work in several CS courses, including the introductory sequence and his project course on real-time, embedded systems. UNI CS on Facebook and Twitter The Department of Computer Science now has a page on Facebook and a Twitter feed. You can find us there by clicking on the icons in the left panel. If you are on either of these social networks, please follow UNI CS for updates, information, and occasional links of interest. You can also network with students, faculty, and alumni. Please join the Department of Computer Science as it launches the new school year with a potluck picnic this Sunday, September 11, at 5:00 PM. All students, faculty, staff, and their families are welcome! We will meet at Seerley Park, which is only a few blocks from campus down (you guessed it) Seerley Boulevard. The department has reserved the shelter on the east side of the park. The city is doing some work on the boulevard, so you will want to approach the park from the north. Computer Science students Aaron Mangel, Sean Fredricksen, and Keisha (Harthoorn) Fortney were busy this summer with undergraduate research projects pushing the boundaries of technology. Read more about their work in Summer Undergraduate Research Successes. Summer orientation for the Class of 2015 is underway, and other changes, as well. Effective July 1, the Department of Computer Science will become part of the new College of Humanities, Arts, and Sciences, being formed out of the merger of the colleges of Natural Sciences (our current home) and Humanities and Fine Arts. Being a part of the new college will give CS an opportunity to strengthen interdisciplinary efforts with colleagues in areas such as communication, music, and art. More information on the new college is available in the provost's announcement. "StructAlignViewer: A Software Package For Visualizing Protein Structural Alignments"
"Increasing the Accuracy of Protein Three-Dimensional Structure Comparison"
Join students and faculty on Friday, May 6, for the department's biannual Undergraduate Research Day. The talks will start at 8:00 AM and on the half-hour thereafter and until 12:30 PM, in 322 ITTC. Feel free to come for any or all of the nine talks, on topics ranging from user interfaces to networking to language design. Teams of students from NU High School took the top two spots out of twenty-eight teams competing at a cyberdefense competition in Ames over the weekend. UNI CS and NaSA students coached the NU High teams as they prepared for competition. NU High has now won the competition four years in a row. Four Computer Science seniors will present their honors theses at the UNI Honors Programs's Research Day this Saturday, April 16. All four talks are in 222 Lang Hall. Professors Ben Schafer and Stephen Hughes have been awarded a Grow Iowa Values Fund Technology Transfer Grant for their project, "A Smartphone/Tablet App for Collaborative Classroom Input". This grant will support their research on different modes of classroom participation, as well as a course on programming mobile apps to be offered this fall. For the second consecutive year, Google has awarded the CS department a grant to offer a summer workshop for middle- and high-school teachers, to help them learn about computer science and how to use it in their classrooms. Last year's workshop was CS4HS Iowa 2010: Introducing Computing via Scratch and Simulation. You can register for the workshops now! Bioinformatics major Jack Kosmicki has been awarded a 2011 internship at the prestigious Harvard-MIT Bioinformatics and Integrative Genomics Summer Institute. This will be Jack's second year working at the Summer Institute. Book Hatchery, a service created by Computer Science major Nick Cash to help authors publish their works digitally, was recently named by Inc. Magazine as one of the coolest college start-ups of 2011. A group of CS students, under the supervision of Prof. Paul Gray, are preparing to defend UNI's title at the 2011 Cyber Defense Competition, to be hosted by Iowa State this coming weekend. The CDC challenges student teams to support multiple domain services through the night in the face of aggressive attempts to compromise their systems. The first Computer Science seminar of 2011 is this Wednesday, February 16. Lahrin Koucky, an Operations Manager with Oracle Education Initiatives, will give a talk entitled, Are You Job Ready?, on how students can transform their school projects into a technology portfolio that impresses employers. Copyright 2006-2019, UNI Department of Computer Science. All rights reserved.